My life has changed so much in the last 531 days, that I sometimes just have to turn off my mind, or else I end up sitting around and thinking too much. There's a fine line between constructive self-analysis and counterproductive self-abuse. But you know what I've decided? The positive far out-weighs the negative. Because without the positive, well, I don't know if I want to think about that. But I do anyway. What if I were still over 500 pounds? Would we still have the changes in our family unit? I don't know. I really don't. I am certain that I'd be miserable, probably unemployed, more than likely divorced, and a complete mess health wise. Might not even be alive at this point. At over 500 pounds, you just never know, you know? I'm so very thankful to have Irene by my side. She has endured two decades of me saying...”someday”. She has always believed in me despite the many false starts and failed attempts. She has watched over the years how my weight has limited me in so many ways. She's so extremely patient and loving to still be by my side. A person can only take so many broken promises, and she's exceeded the maximum amount any spouse should be expected to endure. She's doctored me, nursed me, wrapped my bad right leg because I'm too big to do it myself, and she's done it so long because she loves me. But she knows that I have the power inside to change, she knows that I have the power to make the daily decisions that will eventually “free” her of these nursing duties. She knows that if I stay on track my health will improve to the point of being normal once and for all. Imagine how my past failed attempts have frustrated her. She knows that I know what I need to do, but for so many years I haven't done it. I've flat out taken advantage of her devotion, and that's shameful. It's an indescribable kind of love she has for me, she truly understands “for better or for worse”. She deserves to experience the “better”part ...and that's why I'm so dedicated to going all the way on this journey. So if I sometimes sound obsessive about calorie counts and exercise schedules, there's a reason. People say, “you've got to do it for you”, and that's true, and I am. 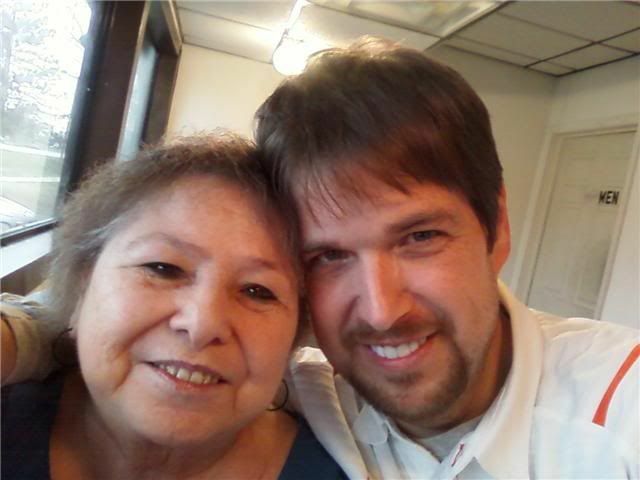 But I'm also doing it for Irene and my daughters and my future grandkids and my mom. Thank you Irene for holding on and never letting go completely! I love you! That kills me to read. Maybe I shouldn't be reading that stuff. Can we start this post over? I really want to erase it all and make this another extremely positive and uplifting post. Because that side of this journey is much more fun to write about. It is positive and uplifting. But as much as I want to erase what I've written, I can't. That's the deal. I have to be honest. I can't fake it. This is how I feel today and this is a daily diary---open to the world, and I can't be true to you if I'm not first true to myself and my emotions. I've written in these blogs how I've never been a stereotypical 500 pound eater. I've never consumed unimaginable amounts of food in one sitting. But I have been an “impulse” eater. I was reminded of that today when paying for gas at a convenience store with a deli case full of fried everything. I'm immediately drawn to that deli case like a bee to a picnic area trash can. The egg rolls are better than any I've ever tasted at an actual Chinese restaurant. The burritos are crispy on the outside and deliciously soft on the inside, and the corn dogs were on sale two for a dollar! There is absolutely no way the old Sean could have gone in there without at least buying two corndogs for a dollar! That's just being a smart shopper...and an impulse eater. Because it wouldn't have mattered that I just had dinner or was about to have dinner. If I wanted that taste, I was going to have it. Ok---Let's call it what it is: Food addiction. There, I admitted it! They always say that admitting the problem is the first step to recovery right? I'm a food addict pure and simple. I very rarely eat because I'm hungry, I eat because I want it! You can tell that over the years I've become well acquainted with me and my dysfunctional eating habits. I've dug deep to understand my bad habits, but even armed with this information, knowing how I am, and the negative effects of my behavior, I'd still do it. I'd probably have to undergo professional psychiatry to go deeper into understanding why I developed these eating patterns, but I've gone deep enough on my own to identify them, and I think getting any deeper would just reveal “excuses.” I'm finished with excuses. I'm changing my deadly habits now. And it feels good! Every time I easily click that seatbelt, I'm reminded of my success so far. Remember me talking about the “results snowball effect”. It's very true. Positive results are a powerful motivator to continue doing the right things. And the more right things I do, the more results I get, the more motivated I get. My workout today was fast and furious. I slept way too much and before I knew it, it was time to get ready for my evening. I had planned to attend a stage production at NOC tonight, but my plans changed dramatically at the last minute. I was dressed and ready for the theatre. But something very important came up and I had to cancel. In preparation for my night out, I hurried through an upper body workout and a quick two miles on the treadmill. I say “quick,” but really---it was mostly power walking with occasional spurts of jogging. It was good, or at least it made me feel good. I enjoyed some grilled chicken and some wild rice for dinner. I don't normally have rice, but it was good and well within my calorie budget. It was a normal portion. I later treated myself to a 150 calorie soft-serve low fat ice cream cone. Yes---I still turn to those when I need a treat. Yes I said “need.” Sometimes we need a treat. And when that treat doesn't wreak havoc on our calorie budget, it's a bonus! I've been reading your blog for quite some time now (not since Day 1 but for well over a year at least) and I really enjoy reading your daily posts. I'm not a blogger myself but I went through my own weight loss transformation a couple of years ago after being obese for the majority of my formative years, from about age 10 until 22. I completely agree with your fundamental philosophies regarding consistency, honesty, and simply eating better and exercising (along with that pesky task of facing and tackling the addictive behaviors that fueled the weight problem in the first place)...who knew it was that simple?! ;) I just really wanted to say thank you for your blog, as reading your posts each day helps me to better maintain my own personal journey towards healthy living. Congratulations on all your well-earned successes! It was a little harder to do my morning warm-up workout today. I've seriously slacked with this morning ritual of getting up and dropping to the floor, and I could tell this morning. It's no surprise really. If you do something on a regular basis, your body gets accustomed and it gets easier. After the body makes adjustments in a positive direction, and then you stop being consistent with that routine---it makes some more adjustments, the other way. Breakfast this morning was very simple. I enjoyed two eggs over-easy and a banana. It was 240 calories enjoyed. I thought about adding some oatmeal too, but decided I didn't want to use what I made the other day. I prefer my oatmeal fresh. I grabbed some more fruit and headed out for my morning. We expected snow overnight, but somehow we were spared the brunt of the storm. No complaints here. I'm ready for warmer weather! Today was going to be stressful. I knew that going in. My stress level lately inspired me to write yesterday's post. And writing that one really helped me get through this day. I remember looking forward to Fridays...you know, when I was a kid---the weekends were the best. I'll get back to that excited Friday feeling someday. We're going to make it, and we're going to do it in fine form and fashion. I'm seriously proud of the breakthroughs I've discovered for myself along this road. And trust me...remaining true to myself and keeping this ship upright even during the nastiest of stressful storms, that's huge. I stopped posting a mirrored version of this blog on myspace around day 370 something. I very rarely even check the myspace account. I haven't logged in there for a very long time. I do however enjoy facebook. So feel free to look me up: Sean Anderson, on facebook---friend me, and I'll accept! About that excerpt from Day 165: I hope Google doesn't get offended and shut me down! They wouldn't do that, would they? I mean---maybe I shouldn't be so harsh on Google, after all---they're providing me this blog space at no charge, when at this point---I would pay to keep it if I was told I hadn't a choice. After a short nap, then a workout---I was ready for my evening out with friends. Once again, I was the designated driver. I'm really starting to evaluate how I spend my time and how productive I'm making that time. I honestly could use some adjustments in this area. I have big plans, big dreams, huge goals...and these are things that need more of my attention. I'm not saying I'm going to stop going out with friends, but I may need to seriously cut back. I know what I want—and I know that the commitment needed for those lofty goals requires a new level of diligence. This before picture is one of my favorites. 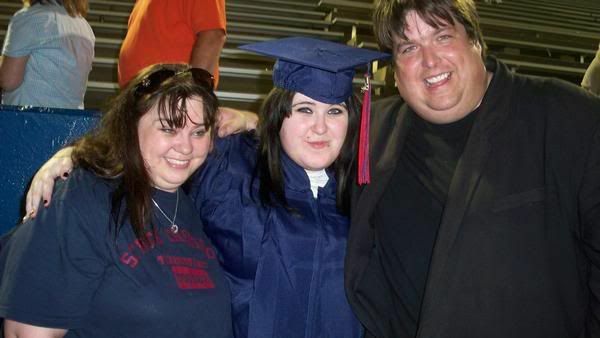 Snapped at Amber's High School graduation, we were all bigger—I was well over 500 pounds. And shortly after this picture was taken---we hurried home to a party that included a multi level white coconut cake that I assembled with help from Pepperidge Farms. I used like five of those cakes and towered them on top of one another. I wish we had a picture of that giant cake. One of my favorite “In-Progress” shots. 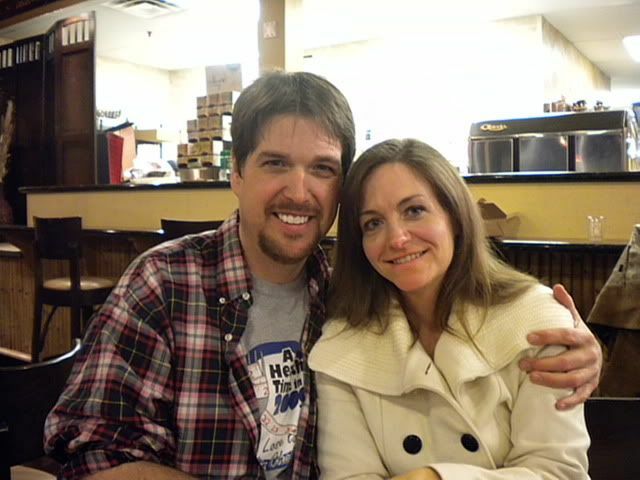 Snapped several months ago with Irene in the kitchen of our old house. My favorite “current in-progress” picture. With my oldest. This video was from exactly one year ago today. I can't get over how big my face was—just 120 something pounds ago...wow. After writing about the “brow-bird,” my dad left this humorous comment from his home in Alabama: The uni-brow is a family trait, I am proud of mine. It was passed down from my moms side of the family. Her mom had one, and so on. I think I got my mustache from my grandma too. your dad Veyon. A good sense of humor is also a family trait! I always handled stress by eating. It never improved the stressful situation, but for the amount of time it took me to devour that bag of fast food, I was in another world. Food was a temporary escape, a distraction from reality, it was medication. How I handled stress by eating was my biggest fear along this road. I didn't look at it like it was a choice, I was convinced it was fact: If I'm stressed, I'm going to eat...a lot. I spent years and years over 500 pounds because of this stress eating acceptance. I always told myself and my family, “as soon as I can get rid of some of this stress, I'll be able to do it, I'll lose this weight once and for all.” And then I would dream. Not about finally losing the weight, I would dream about this magical stress-free life that would someday set me free, enabling me to finally lose weight. Well let me tell you my friend, the stress never went away. In fact, in many ways it's increased over the last 529 days. Stress is a part of life. It comes in many forms. Some are very real pressures, some we create in our head, but it doesn't matter---real or not, stress is something we all have in one form or another. And everyone handles their stress the best way they know how, even if they know it's not really the best way. On September 14th, 2008, I thought about this problem all day. I was extremely stressed, but I knew I had to somehow grab control regardless of the stressful circumstances of our everyday lives. The next day was my day 1, and in many ways I felt like this was my last chance. It was do or die, or at least—do or lose everything important to me, be miserable for a few more years, and then die. I was scared, very scared---and I knew that if I was going to be successful at losing weight, I had to fight hard against my biggest nemesis of all time: Me. Staying focused is sometimes a very difficult thing to do. Most of us know what our triggers are. Triggers are situations and circumstances that put us at our weakest point in terms of staying on track. My trigger is stress. Any and all stress. Job stress, financial stress, family stress. It all adds up to a big mess of stress. And I'm sure you've heard people say...”I'm an emotional eater”...aren't most of us? I'm not just an emotional eater, I'm also a celebratory eater and a spur of the moment craving eater, I'm a “ah, the heck with it, give me the double decker with extra cheese and bacon” eater. Identifying your triggers is important. What makes me feel the urge to eat a couple thousand calories in double cheeseburgers and ice cream? Stress. I identified this trigger several years ago. And for the longest time I've used that as an excuse not to get busy with this mission. “I'm just too stressed out to get started right now”...Or, after a successful couple of days, totally going nuts on a half gallon of tin roof sundae, then thinking...”I can't do this right now because things are just too stressful. So recently I had to ask myself: If I'm waiting to have a stress free life before I start losing this weight, will I ever start? The answer was no. We all have stress in some form. Stress is part of daily life for most people. Stress can be so many different things. So I realized that if I were waiting for my world to be completely perfect and stress free, then I would never, ever, ever start this. We have to adjust our strategy in the face of our triggers. We have to stop long enough to ask ourselves, will eating this really improve my situation? What can I do besides over-eat that will help me deal with this issue? I've turned to food for comfort for so long, that I know how incredibly difficult this can be. My smart and beautiful wife mentioned taking one day at a time in a comment she left on yesterdays blog, and you know what? She's so right. One day at a time I deal with cravings, one day at a time I deal with triggers, one day at a time I succeed. Eventually all of those “one day at a times” will add up to an amazing result. I've talked about this tonight, because I've faced some pretty big triggers today. It was a very stressful Monday. The most stressful day out of the eight days so far. And you know what? I won. I identified the triggers, I knew I was staring them down, and I didn't blink. The right mindset can be a very tough opponent for stressful triggers. I keep remembering my motivating thoughts. It's always good to keep those motivators handy just in case you need them. I've stayed within my calorie allotment, I'm getting ready to work out, and tonight I will go to bed knowing that despite my challenges and stress today, I made it one more day. One day at a time! And seven more “one day at a times” and I get to weigh!! I can't wait! One day at a time. That's it. I just have to survive this one day. But how? I rely heavily on my motivating thoughts. These thoughts and dreams of the future that hold so much promise. And I fight to defend the integrity of this mission. Identifying the excuses and rationalizations that always signified surrender was a big step toward victory. The self-honesty factor had to be extremely strong, unbreakable and brutally honest. I had to make an iron-clad decision that no stressful trigger, no circumstance, no emotion, person, place, or thing...nothing was going to steal this away from me. I wasn't going to steal this away from me. That iron-clad decision had to made over and over again with each new threat. This decision to not allow anything to stand in the way---it was fueled by setting an importance level so high---that success was the only option. Success or death. No room to fail...this was it. It had to be THAT important. And it was and it is to this day. If you haven't already guessed, today has been a very stressful day. Tomorrow looks to be even more stressful. I'm going to make it through just fine, but believe me---I'll do it by tapping into the basic fundamentals that I had to hold onto from Day 1. The same thing that got me through Day 8, will get me to the other side today. This mission is too important. My iron-clad decision cannot be broken. My motivating thoughts are bigger and better than ever. My dream is alive and I will protect it with everything I have inside. Wow---OK, that was heavy. But I needed that. I needed to write those words. I needed to remind myself that we're going to be OK---and we're making it. One day at a time---and sometimes, one hour at a time. But we're gonna get there by golly. And when the head hits the pillow tonight, we'll close our eyes on another successful day. I had another weight machine orientation at the YMCA today. I had one of these well over a year ago. Back then, I couldn't fit on every machine. Fitting wasn't an issue today, that was so nice! The upper body machines along the east wall face a mirror. The entire wall is a mirror. I always hated that wall. I don't hate it so much anymore. I can remember sitting on a machine and looking at myself and thinking is that really what I look like? I was so much bigger than I perceived, and the mirror was always brutally honest--no wonder why I always tried to avoid that bitter reality check. Maybe if I didn't look, the truth wouldn't exist. It's amazing how much time I spent avoiding and denying the seriousness of my obesity. Today, I climbed into those machines, fitting perfectly--like a normal person, and I asked myself the very same question, but for a very different reason... Is that really what I look like? The trainer at the Y couldn't tell, but I was welling up inside because that mirror was so nice to me today. I'm excited about making these machines a huge part of my workout plans. I love the way they expertly isolate the targeted muscle. I only had one embarrassing moment during this orientation, and that's when I was unable to do an assisted pull-up. There I was, hanging on with my shirt riding up and my stretch marks shining---desperately trying to lift my body to the bar. That's OK---I'll get it, and someday it will be done without the "assisted" part. After my orientation and workout, I headed home with thoughts of dinner and what to fix. Once again it was just me. I had some options, but I took the easy way out and picked up a Subway sandwich. I passed on the cheese too! That's just not like me. I regularly say "just half the cheese," but today it was "no cheese." I wanted my sandwich to be 300 calories---so the cheese had to go. It was just a calorie value decision. I enjoyed a banana with a teaspoon of peanut butter for desert. It was a very nice 450 calorie dinner. Courtney made it home later tonight, and she's planning on spending a bunch of time with me this weekend. We've had these plans lately and they always seem to get changed for one reason or another. I think we'll keep them this weekend. I'm looking forward to spending time with that girl! Day 528 The Pursuit of What Works---Have You Checked Your Pockets? The Pursuit of What Works---Have You Checked Your Pockets? I searched for years, well, not really actively searching everyday, but curious always at least, wondering what really works? I was conditioned by our culture and society from an early age to believe in order to lose weight, you had to have a plan. Not your own sensible plan, because that would be too simple and free, and we know that if it's free it can't work, no, no, no...we gotta pay to lose weight if we expect results. We need someone else's plan! A plan or product someone else designed and now charges large amounts of money for. Now if this plan is all about learning portion control, self-analysis, and exercising, then great...sounds good, but kinda boring...and boring doesn't sell. I want amazing success claims! I want you to tell me that I can basically sleep and gorge all day long and still lose weight. I always thought that the secret must be in a product or system somewhere on a store shelf near me. When I would run into someone who had lost weight, my first question was always: “How did you do it?” This is often the first question that comes to mind for anyone. I always wanted to hear about a miraculous new product that would magically melt away my fat in the middle of the night while I slept regardless of my food intake or lack of exercise. As crazy as that idea sounds, that's exactly the message I've watched before on an infomercial in the middle of the night. Perhaps you've watched the same one. Did you notice the fine print too? “Product to be used in conjunction with a regular diet and exercise regimen.” Really? I have to make an effort? Then why would I want to take these again? Do they even contain anything other than a placebo and a slick marketing campaign that targets the desperate and dangerously overweight at 2am? But for years I had an open mind and a willing ear to listen to anyone that had any information on what worked. As long as that solution didn't involve certain things, like personal responsibility, educating myself on portion control, understanding, analyzing, and reconstructing my behaviors and please don't say exercise! Noooo! I can't move! What? You want me to kill myself? Listen, I understand the hopeless feelings that consume grotesquely obese people. I've been one for years. The dream is a miracle cure, that never comes along. Oh sure, people lose weight on all kinds of products and systems. I'm not saying you can't lose weight on some of these things. People do everyday, but it's like spending money on cleaning up the mess from a broken sewer line, but not fixing the broken sewer line. Sorry, that's a gross but effective example...but you see what I mean, right? That's why so many people gain back everything they lost and more! They cleaned up the mess caused by the real problem, but they didn't address the real problem. When they repeat the process over and over they call it...”Yo-Yo Dieting.” I've always heard the definition of insanity is doing the same thing over and over expecting a different result...that's yo-yo dieting! What has driven me to get down to the honest bare truth behind my lifelong battle with obesity? I don't have time to yo-yo any-mo-mo. That was kind of lame, but it made me laugh, so I'm good. I'm learning everyday about food and how to properly handle it, I'm learning about exercise and how to properly do it, and most importantly, I'm learning about me on a level I didn't know existed. For the first time in my life I'm finally finding what I was looking for, and the strangest thing is, it was inside me all along, but I wasn't looking there. It's like searching for your lost car keys for 30 years, then one day finding them in your pocket where they've always been. I prepared the most wonderful egg white omelet this morning. I filled it up with mushrooms and an ounce of mozzarella (oh how I love my cheese!) ---Then I poured on some tomato sauce. I folded over what I call the Pizza Omelet! It was 200 calories of cheesy-saucy-goodness. I loved it! I enjoy my food more these days. That might sound strange, but really, it’s true. I eat slower---I appreciate the flavor---I’m often proud of the calorie value…eating is a new experience. Before, I was just stuffing it in my mouth---it tasted good and I wanted more, and my friends would say “wow, you’re really eating fast!” I don’t hear that anymore. And it’s not something I decided to do, it’s something that has just happened naturally as I navigate my daily calorie budget and the choices that make up that calorie allotment. I was going slightly over the speed limit on the way home when a trooper, cloaked in darkness, flipped his light bar on full blast and pulled me over. I haven’t had a ticket of any kind since 2003, but I have been given a few warnings over the last several years. The trooper that pulled me over tonight took me back to his vehicle and the first thing he asked was “How much weight have you lost?” And I answered: “Uh, 240 pounds…” How did he know? He quickly revealed the answer: “I pulled you over along this same stretch about a year ago and if I hadn’t recognized your voice, I wouldn’t have known it was you!” “You look incredible man, congratulations!” “When I pulled you over last, I listed your weight as 392, what is it now?” I proudly told him 265 followed by my sincere regret and apology for going seven over the posted limit. He told me that he was just writing a warning, no need to worry. That was another very cool experience. I share these experiences because, well---it was part of this day, but mainly because if you’re on this road too---I want to give you a glimpse of what’s ahead for you. You’re going to succeed and you’re going to experience these kinds of situations. You might be like I was for years; only dreaming about it, but it is going to happen for you now…and I can’t wait for you to feel this. I wish I could touch you and transfer the feeling magically, but you just have to get here to feel this. You can do it. I know you can. I arrived home with a few hundred calories left in the budget. I quickly prepared a Flat-Out flat bread chicken and mushroom wrap with mozzarella and feta. I skipped the tomato sauce, just rolling it up instead like a burrito. It was so good! I consumed a bottle of water and all of a sudden I felt incredibly full. Bloated is a better word to describe what I felt. I was bloated, completely. But---I was just under budget and ready to call it a night. My goal of breaking my all time personal weight loss record was a sweet one to hit. Now I'm focused on powering right past it and never looking back. I broke it by four pounds last weigh day. Why is it so important for me to power past this mark? Because 115 lbs lost is where I tripped up in 2004, and then gained it all back plus five pounds. Of course this journey is nothing like that time. It really isn't. I wasn't learning anything along the way back then. I wasn't writing and discovering, I was simply going through the motions needed. I mentioned this not too many days ago. It just goes to show how important it is to really learn along the way. Really open up to a whole new outlook on food and exercise. The writing is so very important. You don't have to share your most personal thoughts and feelings with the world, but still write everyday about how you're feeling and what you're experiencing, even if you're the only one to read it. If you do, I promise it will not only give you daily strength to succeed, it'll make a profound effect on your long term success. If you're completely honest with yourself in your daily journal, then you'll learn all kinds of things along the way. It's knowledge that can help you keep the weight off forever! Thanks for reading my daily weight loss blog. I still have some of the food that Ann purchased on our grocery trips. I'm discovering things that will become staples around here. Almond Breeze unsweetened almond milk is just incredible. I honestly thought I would hate it, but no---and at only 40 calories per cup, I think I just found a better replacement for coffee creamer! The Kashi Heart to Heart cereal is really good too, in fact it's what I had for breakfast this morning—along with an assortment of diced melon. I'm still very careful with cereal, I have to be, but I was satisfied after one serving this morning. Of course my cereal binge mechanism always worked best late at night in front of the TV. It helps when you have some place to be...in like 20 minutes! My workout tonight was a date with the treadmill. I did a solid 5K. By “solid,” I mean---I actually worked hard during that 3.1 miles. I jogged in intervals and made the sweat run. I have to push myself during these, because seriously, at 265 pounds---I can walk a 5K without much sweat. A 5K isn't a good workout for me anymore unless I make it that way. I made it that way tonight. I was pleased. I also messed a little with the machines, and I even set an appointment for another orientation—I need to learn those things in order to help my muscles develop enough to have proper form with the free weights. Really...I'm a big old mess in the weight room. Thank you Ann for the tips and suggestions! This video is from exactly one year ago today. I looked so big! I love this journey!!! I have to talk about the Cracker Barrel situation from last night. I was completely shaken on the inside, horrified at my choices. Not because of what they were, but because of what they mean to me, and the possible effects they can manifest. It was so much bigger than a 270 calorie corn muffin, ½ a biscuit, and ½ an ice cream sundae. You see, I know too much to ever go back, I sincerely believe that. My brain will not allow me to accept the food behaviors that kept me close to and over 500 pounds for nearly two decades. But---what I did last night was loosen my grip on the fundamentals that have helped me shed 240 pounds in the last 526 days. I knew better and I did it anyway. You might say “Sean, seriously man---relax already…it’s ok, lesson learned…move on.” And I will, I am, but I must recognize and analyze what really happened in that Cracker Barrel---I must understand it to prevent it from becoming acceptable. Maybe I think too much, but maybe that’s exactly why I am where I am. I’m just a student really. I’m learning just like you. And I’m digging deep to learn the good stuff, the deep stuff that has puzzled so many for so long. I long for understanding. I’ve found a bunch of it, I want more. And I’ll get it. Walking into that IHOP with complete confidence was very easy. There was no way I could or would allow a repeat of last night. I decided before we left the hotel: A couple of whole eggs and some toast, maybe some fruit. I was pleasantly surprised to find a wonderful new menu called IHOP for Me. It’s full of better choices and comes complete with entire meal calorie counts. It thrills me that many restaurants are moving in this direction. IHOP impressed me today, they did. 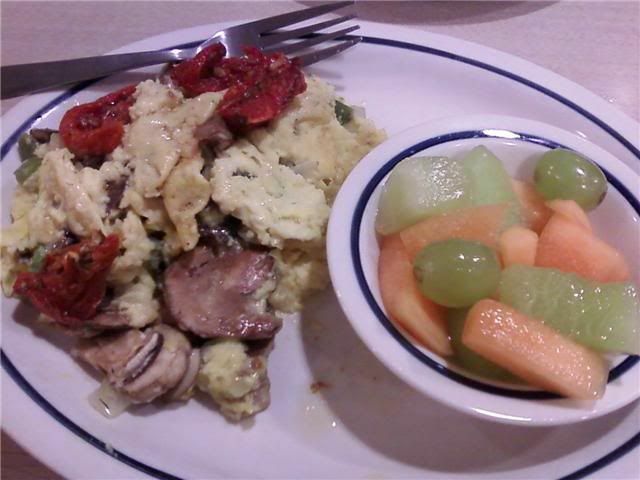 I ordered a veggie omelet made with Egg Beaters and a side of fruit. I also enjoyed several bites of Ann’s harvest grain blueberry pancake. The meal was 360---and with coffee and the bites of the pancake, I was satisfied with a total breakfast count of 500 calories. That’s a little more than I usually have at breakfast, but it felt good and right. Bottom line? I was confident with my choices this morning. I had a great time meeting and getting to know Ann over the last four days. I know that we’ll be friends for a good long time. The laughs we shared and the conversations we understood were worth it all. So many similarities and understanding are revealed when you share time and space with someone who has also experienced this kind of total transformation. The universal truths of food addiction, or addiction of any kind, and the personality traits that come from that addiction can be understood, untangled, and eventually liberating---or misunderstood, confusing, and forever imprisoning. I’m working toward the understanding and untangling part. Aren’t we all just trying to find freedom? After taking Ann to the security checkpoint, it was time for me to head North for mom’s place. We planned on having coffee out and conversation before I headed home, and that’s exactly what we did. Mom is so wonderful. I’m truly blessed to have such a great mom. She’s always listening, always asking questions, but never judging and she's very trusting. I love her dearly. We couldn’t help but snap a picture this morning. My afternoon wasn’t completely free of work. I had a broadcast to do from the new Verizon Store. The ribbon cutting ceremony was full of local dignitaries and it never fails…people come up to me in awe of my transformation. The manager of the store remembers me from a year ago---and she just couldn’t believe the difference. She just kept looking at me. Then, as we talked about the event, a customer popped in with “Sean, is that you?” It was a very nice lady that use to work at city hall, she remembers me at my heaviest---and in the very beginning of this journey. She was stunned by the difference to say the least. These type of “wow” reactions are incredibly intoxicating. And when I heard someone say that they couldn’t eat one of the mini-sandwiches available because “I’m on a diet,” I parlayed that into an opportunity to share this blog address. It was a good experience. It always is these days. I can remember years past when hiding in the remote vehicle, just hoping that I could do the entire broadcast without seeing too many people was the norm. Now I want to see people. I want to smile. I want to experience life again. It’s safe to say my work performance has improved because of the weight loss, absolutely. I visited the studio tonight to talk with Courtney a little bit (she was working). She’s coming home to the apartment tomorrow night and staying a few days. That’s good, real good. I need some good quality time with Courtney like I had with Amber recently. I drove back to the apartment and decided to do something in regards to a workout for today. I was extremely tired---but made sure I did some good strength training exercises before bed. I usually wait until I get up---but I needed it tonight, I did. I honestly needed a bigger and better workout---but that’s in the books for tomorrow. I was exhausted tonight. It was a very long day. 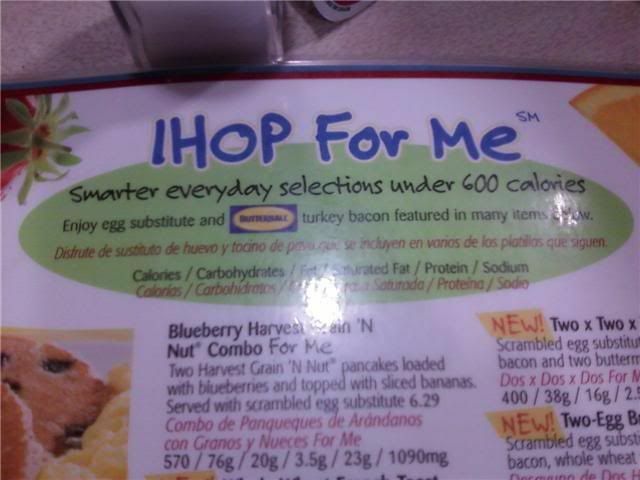 Good job IHOP! Great idea. My breakfast plate. The omelet looked more like a scrambled egg type thing, but it didn’t matter---It was really good. Mom is the best, pure and simple…the best in so many ways. Sunday morning came fast and early. My fellow blogger friend Ann and I both understand the very important role breakfast plays with our metabolism. So what did we do? Had breakfast of course! Ann decided she was going to get me to eat spinach one way or another---and she accomplished that goal this morning. 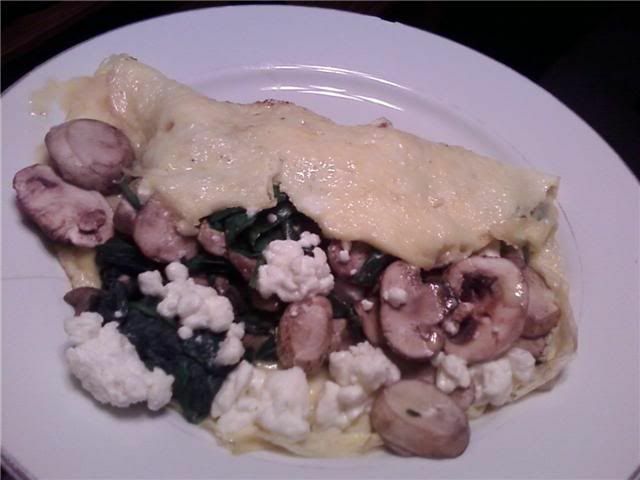 She prepared a wonderful spinach, mushroom, and feta cheese whole two-egg omelet that was really good and under 300 calories. It was filling and loaded with flavor and uh, spinach...yeah. Yay for spinach! It was delicious, seriously, and I'm sincerely appreciative of the breakfast---But honestly...I'm still not a huge fan of this green leafy super food. The feta cheese and mushrooms? Bring those on all day long! It was very nice Ann, thank you! Today was the last day of Ann's visit from Boston. We talked about what I've learned the past four days, and really, I've learned a bunch. Watching the documentary “Food Inc.” was seriously eye opening. It didn't turn me into an instant vegetarian, but it did educate me on how the food industry works. I really didn't have a clue before watching. A bunch of the food philosophy, ok...98% of it at least, I've heard Dr. Amy echo. Ann and Dr. Amy think exactly the same way about good food. They're both very educated on the subject. It's important to remember---I'm simply learning about better choices and about what makes them better choices. My choices along this 525 day journey haven't been wrong, the opposite actually, they've been exactly the simplistic approach and pace I needed to finally be successful at losing weight. But striving for better choices and evolving the overall health of my “good choices,” is paramount to my growth. I don't regret a thing I've done food wise. If you're a long time regular reader of this blog, then you know my philosophy and why my “nothing is off limits” approach from Day 1 has been key to my success. The best changes are the ones that naturally and gradually occur. Ann and I also discussed my workout and fitness structure, or lack of structure, and what I can do to optimize my results. The bottom line? Consistency. As you might already know, I have serious “calendar regret” when it comes to weight training. I should have been doing it on a consistent basis from early on this road. But I didn't. I focused heavy on the cardio and fat loss. But it's not too late to claim that part of the transformation I've severely neglected. Ann showed me around the weight room and helped me with my form today. It was slightly embarrassing to say the least. My arm strength is ridiculously weak and my form is horribly uncoordinated. But you have to start somewhere. Melissa Walden has recognized this about me too. That's why she has me doing the non-weighted strength exercises. A big deterrent to proper form, for me---is my right arm problem. I've written about this birth defect before. But it's not something that can hold me back. It simply makes the beginning a little more challenging, that's all. And I don't want to sound like I'm making excuses---but I think Ann could see how intimidated I feel in the weight room and why. She also knows that it's a mind thing within my own brain---and not a real obstacle to my development. Look at Tony “The Anti-Jared's” arms. He didn't just lose over 200 pounds and somehow magically have those guns he sports. No, he's worked his tail off in the gym lifting and building those things with consistency. Lunch was just amazing. I enjoyed a roasted vegetable and mozzarella Flat-Out pizza and Ann enjoyed a big salad with a foundation of leafy spinach. The 'On The Go' Video is below. My pizza was only 220 calories and it was chock full of incredible flavor! What I'm about to write about may shock and disappoint you. I really shocked and disappointed myself tonight. We were in Oklahoma City because Ann has the first flight out in the morning. We were looking for a place to have dinner. Ann told me to pick something—and so I did. I've never been afraid of any restaurant. I've often bragged about there not being a “restaurant I can't navigate” with good choices. My first pick was Panera Bread, but they were closed. My second pick was Subway---again, closed. My third pick was Cracker Barrel (cue the music of doom) unfortunately, they were open. I walked into that Cracker Barrel with a swagger and confidence that losing 240 pounds has given me. I can beat this place and I knew it. I was also confident that Ann could maintain her clean eating standards within the confines of this American restaurant institution. I was so wrong on all counts. It started off with Ann noticing that even the Cracker Barrel's healthiest vegetables are cooked with animal fat, it says so right on the menu. Kind of like Cracker Barrel is saying these might sound healthy, but wait---we found a way to make them taste better with animal fat, enjoy! I looked over the menu, trying to find the items that would jump out at me as the best choice, and I seriously was struggling. That's when Ann mentioned the idea of ordering from the kids menu. Brilliant! I still had a thousand calories remaining from my 1800 daily allotment---and even though I don't like to exceed 500 in any one meal, I really wasn't worried too much---as long as I didn't go over my limit for the day. It's real easy to exceed a thousand calories at Cracker Barrel, too easy really. Ann decided on the kids grilled cheese with cinnamon apples and a side cup of vegetable soup. That really sounded good and harmless. Ann told me that the meal did violate her standards—and it was something she hasn't done at all in two years. She was willing to bend enough for us to make it through dinner before her flight home, but she feared getting sick. The soup was suppose to come with a corn muffin, when ours didn't, we asked for a couple. The server brought out two corn muffins and two buttermilk biscuits. Oh boy...no problem. In looking at the plate, I figured (incorrectly—we found out later) the corn muffins would have a better calorie value than the biscuits. So I allowed for one corn muffin. Then, knowing that I had plenty of calories in my budget---I decided that ½ a biscuit couldn't hurt. After all, it was 180 total calories at worst if I compared it to a KFC biscuit, and these were a little smaller---and I was only having half. What started out as acceptable choices within my calorie budget was about to turn into something else. I don't know what possessed us really. I guess we decided that a desert, split between the two of us, could be an acceptable thing. But that was a big giant lie we told ourselves. Considering what we had just consumed, a polite “no thank you” would have been a perfect response to “Did you save room for desert?” We looked over the desert menu and decided to share a Frozen Mug Ice Cream Sundae with roasted almonds and hot fudge. What in the world were we thinking? I'll tell you what I was thinking. A few bites, ok—maybe 200 calories worth of this little treat, I can live with that. But what we discovered later in regard to calorie counts was rather sobering. After our nice little kids menu dinner at Cracker Barrel, I couldn't get back to the hotel quick enough. I wanted to get online and obtain accurate calorie counts. I had my guesstimates---but I had a horrible feeling that I was wrong, very wrong. And wrong in a very deliberate way. I didn't “accidentally” shove that corn muffin, biscuit, and half a sundae in my mouth. Those were my poor choices. I had a sinking feeling of regret as we walked to the car. You have to understand. I've gone over my calorie budget only once before in all of these 525 days. I've been wildly successful at losing this 240 pounds so far because of this consistent calorie budget track record. But here I was---realizing that I may have just robbed the bank. The security and integrity of the “Calorie Bank and Trust” was breached tonight. Trust...hmmm, yeah---I trusted myself to navigate Cracker Barrel with ease. I waltz in all confident and walked out scared and defeated, a victim of my own bad choices. I checked online and found the sobering truth. The grilled cheese—350. The cup of soup---49. The cinnamon apples---180. Now---Had I stopped right there, I would have felt wonderful. Nope, didn't do it. The corn muffin?---you ready for this?? That tiny little, surprisingly dense corn muffin---just one of them? 270 calories. I didn't believe it at first, but check after check of different sources confirmed my fear. To Ann's credit, she warned of the danger after one bite, saying she “tasted the fat” in them. I still couldn't place a value higher than 120 on that little muffin. 270. wow. And the biscuit---133--not bad in comparison, and thank goodness I only had a half a biscuit—then added 35 calories worth of apple jelly. The real kicker to the whole experience was the worst choice of all. That sundae checked in at 600 calories, yep---300 each for half. Are you doing the math too? Let me save you the time: I'm ashamed to say that I consumed 1249 calories tonight. 249 over budget. It just sickens me. But listen...lesson learned. It goes to show you, even someone like me can't let their guard down too much in situations like this. Some of my choices tonight were downright crazy. I was clearly not thinking straight. Some might say the two of us negatively influenced the other, or maybe our two positive approaches created a negative...but whatever. We are both responsible for our individual choices...and they were bad tonight. I'm embarrassed and ashamed to have to share it with you---but that's the deal. You get it all right here. And you better believe: This kind of performance will not be repeated anytime soon. I could have stopped at 579 calories, but didn't. I chose to keep going. I kind of wish I hadn't gone in with so many calories left in my budget for the day. If I'd only had 600 left---it wouldn't have been an issue, none of this—because I wouldn't have had room to guesstimate the extras. Oh well. It's done. Lesson learned. We'll move forward now. I'm ok---you're ok. It's all ok. In a place like Cracker Barrel—you have to walk delicately---your choices have to be precise and well thought out...it's just too easy to make the kind of mistakes I did tonight. Look mom! I'm eating spinach!! For a second... This was breakfast. It was really good!! Lunch is good. Look at all those veggies I'm eating! Where's the “On The Go” Video from the Cracker Barrel Meltdown? Yeah---gotta get past that. Cereal. Yeah, uh....love it. I had a bowl tonight. Kashi Heart to Heart with ½ a banana, some blueberries, and Almond Milk. I measured everything too and even with the banana...it was 230 delicious calories. As I approached the end of the bowl, I felt that old familiar reflex to fill the bowl again. I'd never had sugar free almond milk, and it absolutely rocks. Is this a trigger food for me? I think so. Wow. I recognized the old habit and said it out loud. Ann was dealing with the same trigger. We shut it down...we talked about it, we worked through. As much as I say I'm in 100% control, I still have these old cravings and habits that try to sneak up on me. I haven't made a concentrated effort to keep certain things away from me, but I have just naturally stayed away from having any of this stuff in the house around me: Ice Cream you have to dip into a bowl or eat out of a carton, cold breakfast cereals, breads, peanut butter, and I'm sure there are others. I just have to be extra cautious around these things. My defense system, or “Steel Curtain Zone,” is heightened when these things are around. Because seriously...As 'in control' as I am, and as successful as I've been—I'm still a food addict. I mustn't forget that. Ever. I've argued with this idea before, but I can't deny it any longer...The idea that once you're an addict, you're always an addict---I hate that. But on many levels, I can clearly see that is the truth. We're all recovering food addicts, just talkin' ourselves down off of ledge after ledge. It's gonna be all right, really...we're going to make it. The plan today was very simple. Get a decent workout, have a great homemade dinner---prepared by someone other than me—for me. Oh, it was so nice! And after that special dinner---we would head out to get that tattoo I've often mentioned. 505, my starting weight, on my chest---really small, right over my heart, and backwards. So I see it 'right' in the mirror. It seems I didn't plan this very well. When we called ahead to the preferred tattoo shop in Kansas---they were completely booked for the night. So we tried a local place...nope, not happening tonight. I had big plans for this tattoo! The On The Go Video would have been fun to shoot and post here. Oh well, I'll get it soon. I really wanted it tonight, but it's fine. I'm patient! Ann took the time, trouble, and expense of cooking me a lovely meal tonight. The homemade sauce was just amazing. It was full of flavor and cooked all day long, filling my apartment with it's sweet smell. 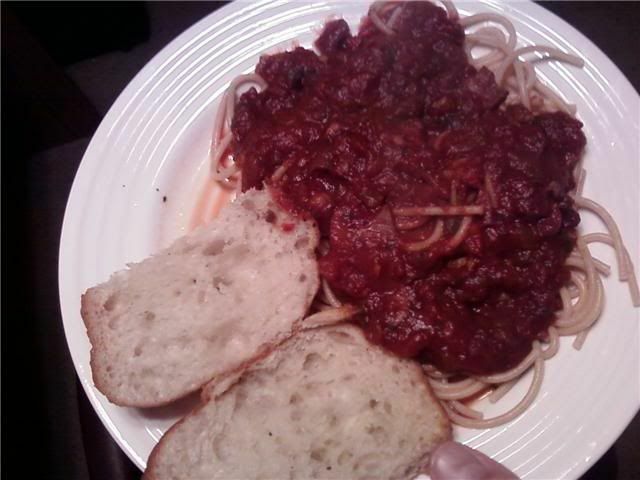 She used organic whole wheat spaghetti and a roll that we split from Whole Foods. She also roasted some veggies for a side dish, but I didn't do any of those. Roasted summer squash, zucchini, onions, mushrooms, and peppers---red and green. We're having them for lunch tomorrow instead. And yes, I will be eating them too---probably on a Flat-Out pizza! This is a wonderful plate of whole food goodness. And below 500 calories for the entire plate. Easily the most flavorful—best tasting spaghetti I've ever experienced. Nice Job Ann, Thank you! Actually, Ann has been very cool about my less than clean eating habits. And she's impressed with my calorie management skills. She's not a judgmental type of clean eater, thank goodness, I couldn't take that. Yes, I was disgusted by what I watched in the documentary “Food Inc.” last night, but I'm not a vegetarian yet, don't really plan on becoming one. I could see where it might have that effect on some. Becoming a vegetarian wasn't the goal last night. The goal was for me to become better educated about the food industry, and well, mission accomplished! I've tried an Amazing Grass bar and drink, Pop Chips, unsweetened vanilla almond milk, and several other organic---all natural items. It's good stuff, and make no mistake, you still have to limit your intake on this stuff. It would be real easy to be an overweight vegetarian. We visited Health World today. I've driven by Health World a thousand times over the last decade without ever stopping to see what they had inside. I was shocked at some of the prices of the “good” stuff, and really attracted to some of the calorie values, some---not all, but some were just awesome. I found some fettuccine noodles that checked in at 40 calories a container. The noodles were made of tofu, but still, 40 calories? If I pour enough Alfredo sauce on them, I probably wouldn't even notice the tofu. I'll be completely honest---I'd rather have a small plate of real pasta, over a big plate of tofu pasta. But wow, those calorie values were impressive. Health World was very cool, but there was another place that Ann speaks of fondly---it's the most perfect place for clean eaters to shop and the only one in the entire state of Oklahoma is in Tulsa. “You wanna go?” she said, “Let's do it!” I replied. And just like a couple of carefree teenagers, we were headed to T-Town. Hey, I'm on vacation, this is what we do! 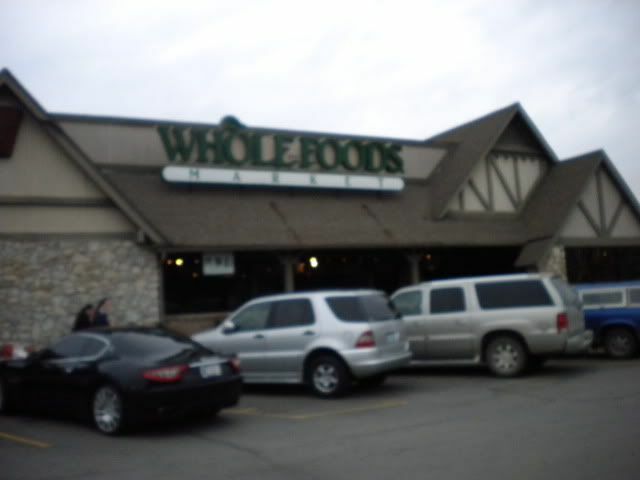 Whole Foods was very impressive, it really was amazing. Everything is good in there. And they have EVERYTHING. If it's food, they carry an all-natural whole version that'll rock your socks. And it's all real. The deserts in the deli area looked amazing. All made with real whole ingredients, we're talking good stuff---and loaded with calories. Shopping that store was a real education in really good choices and really good, but bad choices. Ann purchased a bunch of ingredients for a homemade Italian dinner she's preparing tomorrow night. It'll be just incredible. But do we really need this green leaf? Oh it's fresh basil! My bad...looks like a leaf. Here's a different leaf...fresh oregano, of course, oh this is gonna taste amazing tomorrow night! By the time we arrived back in town, it was way late, and we were really hungry. Ann told me to pick a place. I narrowed it down to a few and picked Mi Pueblo Mexican Restaurant. Ann promised me it would be ok, but I suspected she wouldn't like this place. I ordered a beef soft taco, some guacamole, and a mushroom and cheese quesadilla. Ann tried the veggie fajitas. It all looked good at first. But it didn't settle well with Ann's stomach. She was being nice, allowing me to pick where ever I wanted, and she promised to play along (--no McDonald's--being the only disclaimer). I wish I had picked Subway. I would have much rather had a Subway sandwich. With just enough calories remaining for the day, I introduced Ann to Braum's Frozen Yogurt via the Braum's drive-thru. Ann hasn't been in a drive-thru lane in over two years. She doesn't do drive-thrus, and that's good. I reminded her that she wasn't the one driving, so she can't count this against herself. She still hasn't driven into a drive-thru lane in over two years! Tomorrow night, after Ann prepares an amazing all natural organic veggie whole wheat spaghetti dish with homemade sauce---we're going to Kansas to get a tattoo! I know---Crazy right! Mom, don't you try to talk me out of it!!! I'm getting a simple and small black ink 505 over my heart, and it will be backwards. I'll see it the right way when I look in the mirror. It'll be there forever as a reminder of where I've been and how wonderfully far I've come. Now, if I can just get over the idea of the tattoo gun stinging me like a swarm of killer bees, I'll be fine. I decided to hit the trail tonight for an outdoor 5K walk. Doing what would have put me on the pavement at over 500 pounds is an amazing feeling of freedom. For too many years I felt imprisoned by my obesity. I guess I always realized that there was a way to escape, but the escape plan seemed too unlikely. Maybe impossible is the word. Maybe not impossible, I mean, really I knew it was possible, but escaping was just something I dreamed about and talked about when no one was looking or listening. Like a prisoner behind bars, I just accepted that there were things I couldn't do as a 500 pound man, things I probably never would do, or so I thought. I tried to escape several times, but I allowed my emotions, my fears, and my habits to drag me back like guard dogs at the gate. And just as an escapee gets extra time, I'd get extra pounds after every unsuccessful attempt. Escaping from the prison of obesity forever isn't something that can be done without careful planning, understanding, and opening your mind to learn. Writing about my feelings and experiences everyday and trying to grasp a thorough understanding of what hasn't worked and why, and what can work and why, is like studying the blue prints and guard assignments of the prison. As I go from 505 pounds to a normal healthy weight I'm breaking down every obstacle that stands in the way. What's amazing is, some of those obstacles, the psychological hang-ups, have lost their power over me like a guard giving a prisoner a wink and looking the other way. And when I tell people “you can do this too,” it's like we're a group of prisoners planning our great escape. The team work and accountability to each other is a key element in seeing daylight here. Unfortunately, not everyone will make it out this time. Some will get caught by emotions, stress, and a deep seeded belief that escaping is nearly impossible. But for those of us who do, our letters and stories of hope from the outside can serve to inspire the imprisoned and help them understand the blueprints and guard assignments a little better for future attempts. I've been the one caught by the guards so many times. And when I would settle back in my cell, I'd just accept it for a little while, forgetting about the freedom others speak of, not wanting to hear about what was possible...just focusing on what I perceived as nearly impossible. I was waiting for the right time to make my run. Then one day I realized that I had to escape now or else die too young within those stone walls. I didn't have time to wait for “the right time” to magically happen. My time had to be now regardless of the emotional and psychological hurdles that stood in the way. I'm navigating this escape plan with guidance from those that have gone before me. I'm always studying past escape attempts and analyzing where and why they failed. I can see daylight from here my friend, and it looks so good it makes me want to cry tears of joy. Let's go for it! Feel good? It does, this freedom stuff feels real good my friend, grab a hold! Congratulations goes out to Anson Williams aka Bill, my boss, who has dropped enough weight to fit into 38's! Way to go Bill! If you read everyday, then you might remember the New Orleans food pictures I posted a while back. Yeah---Bill was the one in the Big Easy, taking those photos and eating that yummy stuff! Whole Foods Market at 41st and Peoria in Tulsa. The weather was blurry. This morning was very different. Instead of rushing around the normal routine---I leisurely greeted the day and enjoyed a mushroom and cheese pita pizza for breakfast. I might be addicted to these, seriously. We made our way to the YMCA not long after for a decent workout. If you ask Ann, she'll tell you it wasn't much of a workout. But we're clearly on different levels in the workout room, and that's OK. For me, it was a decent workout---I'll admit, not the best...but decent. Ann showed me some different weights to use in the weight room and gave me some good weight training advice. It was nice really. About four hours after breakfast I made a Flat Out Flat-bread pizza. See what I mean about “addicted?” I prepared Ann one too, hers with just mushrooms and cheese, mine with chicken breast, mushrooms, and cheese. It was a very good lunch. I enjoyed it nice and slow. Tonight we watched “Food Inc.” If you haven't watched this one, wow...It's stunning on many different levels. I had no idea how the food industry worked. A bunch of it is down right sick and twisted. I'm still processing all of the information. I may watch it again. I'll tell you something---I'll be a little more careful with and un-trusting of the companies that I think are giving me good stuff. The practices in the poultry industry sicken me. The beef and pork industries are not good either according to this documentary. Does this mean I'll never eat meat again? No. But it disturbed me deeply, and makes me want to find better sources for some of my food. The food industry is sick on many levels. It was eye opening, it was. I've lost 121 additional pounds in the year since. I was so excited to be 386!!! That's so funny...to look back while weighing 265 now...it's an amazing feeling. I started this Wednesday off by finishing up Tuesday's business. I'm off work today, but I was still up before 6am, grabbed breakfast and was at the studio not long after. I needed a nice break, I did. I just wasn't ready yet! After a few hours at the studio, I was ready to start my time off. I was so busy getting ready for company, I almost forgot to weigh-in! And by the time I did it was so late in the day, I didn't have time to send out my mass text-email weigh day update! It was a very nice weigh day! I'm breaking through this slow patch and eliminating some major “problem” areas. I put the word problem in quotes, because really---after all of the weight I've lost, I don't have a problem to complain about really. But still, we all get an idea of what we want, what we're after. The scale was very kind to me today. 265! 2 6 5! 2 6 5 !!!! 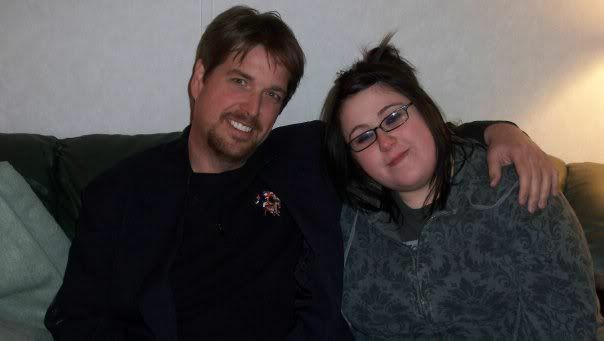 I've lost exactly 240 pounds. Another four pounds gone forever and we're getting magically close to that still unnamed “crossing point,” where I will have lost more than I weigh!! Another 13 pounds to go before we're at that magical place where I'll weigh 252 after losing 253. I'm completely thrilled about today's four pounds, can you tell? Completely proud and happy. I picked up a blogging friend from the airport today. We've communicated back and forth pretty heavy over the last month. She's heavy into clean eating and running, and I'm hoping to learn a thing or two from her about both topics. I've always said that I must keep learning, always open to this constantly evolving journey, so picking up some wonderful advice from this very successful person can't hurt. We're becoming good friends along the way. And although I'm not even close to being ready for exploring the future beyond my pending divorce, it certainly is nice to have a like minded person to keep me company, even for only a few days. I have a feeling we're going to be friends for a very long time. Your comment about keeping things simple reminded me.... I was catching up on some journal papers I've had piling up on my desk since before Christmas, and there was one that I think you'll appreciate. There was a paper that appeared at the end of the 2009 in the journal Appetite in which a team of researchers from the Max Planck Institute in Germany and Indiana University studied people's ability to follow different diet plans. Anyway, the study and the finding are more complex than what I can describe here, but one of the major conclusions was that the more complicated people perceived their diet plan to be, the more quickly they lost motivation to follow it. The most effective diets (in terms of compliance, at least) are the ones that have the fewest rules to follow that people think are the simplest. This morning I took a call from a listener off the air. She sounded upset and sad. She had read my blog and told me that she didn't think she could do it. I wish I would have had more time to talk with her, but I was in the middle of my show. I hope it's from the same person that left an anonymous comment at losingweighteveryday.blogspot.com, that simply said...”I don't know if I can Sean.” I have no way to reply to an anonymous comment, and I'd love to talk with her personally about finding strength, and I'm sure I'll have the chance, as she did say that she's signed up for the “Lose To Win” Challenge, I told her that was a wonderful start. What can I say about finding strength from within? It's something that you have to find inside the deepest parts of your soul. It doesn't come from a product, infomercial, a pep talk, a prescription, doctors orders, or reading this blog. The power to change is inside everyone of us. Getting to that place inside isn't something that came easy for me. I can remember many nights when I would literally cry myself to sleep because I felt so out of control with my weight. 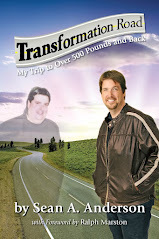 At over 500 pounds, I knew that I was slowly and surely killing myself everyday, but I felt completely powerless. On June 10th, 2008, at over 500 pounds and with my blood pressure raging at 220/118, the doctor looked at me and very bluntly told me that if I collapsed in the parking lot on the way to my vehicle, it wouldn't surprise anyone in that office. She explained what my weight and blood pressure were doing to my internal organs in graphic detail. She wasn't speaking long before I was sobbing. That day I really felt my time was up. I really thought that I had waited too long. I knew that all I could do was start and start right now. Not tomorrow, or next Monday. Really, when you call for an ambulance, they don't set an appointment, they start coming immediately. This was an emergency in every sense of the word. When I arrived home that day, Irene and Courtney could see that I was shaken, and they knew it wasn't good. I told them about the blood pressure, and I couldn't speak without breaking down. We all hugged and cried right there in the driveway. To hear those words from the doctor and then to come home to my family's desperate tear filled pleas for me to save myself, how could I not be able to do it? I know I've written about this experience before, but tonight I felt it worth repeating. That day was June 10th, 2008...I didn't start until September 15th, 2008. Why? Because I didn't think I could do it. I was too addicted to food, I was too dependent on the way it made me feel when I was scared, stressed, sad, and even happy. So when I hear someone say, “I don't think I can,” I know exactly where you are. I understand your pain. I couldn't start until I became completely honest with myself. Oh, I could've forced myself to go through the motions again, like in 2004, and I would have lost weight for a little while, but I knew that it was going to take something deeper for me to break free and do it right. I decided that I had to make this a physical and mental battle. I had to confront myself head on. I had to stop rationalizing bad choices. I had to demand self-respect and that meant 100% honesty to that fat guy in the mirror. I concluded that food wasn't the enemy I always thought it was, I admitted that I was in fact the enemy. I was sleeping and living with the enemy everyday. Food was always my friend, a friend that I took advantage of and used in the worst ways. I decided that I would question every emotion before I turned to food for comfort. I decided that I was the gatekeeper to my mouth, I make the choices on what gets in. I decided that if I was being completely honest with myself, then excuses of why I couldn't do it had to go. The years of excuses why I couldn't do it were over for good on September 15th, 2008 simply because I decided they were no longer valid. I had to think long and hard about all of the positive consequences of losing the weight, from that I formed my “motivating thoughts,” From there I had to hold on tight to those motivating thoughts to help pull me through, I still do. I had to admit that I don't know everything. I had to be open to learn new things. I had to break down the facade of confidence and control that kept me in constant denial. Don't you ever give up. Because you can do this, you really honestly can do this too. The most important exercises I've accomplished thus far have been mental. Isn't it amazing that after years of searching for the right plan, the right pill, the right book, the right miracle cure, the right system...it was with me the whole time? I just had to open my eyes and mind long enough to see and embrace it. Listen, I'm always the first to say that I'm not a doctor, or a dietitian, a nutritionist, or a psychiatrist. And everything I've done and am doing along the way may not be 100% right, but I'm learning more and more about this journey and myself everyday. I'm just a really big guy that has nearly three decades of obesity experience and a longing for a longer healthier life. You can do this. This morning I got up feeling good, optimistic really—it was going to be a wonderful Tuesday. And it was. I started with this upbeat attitude and it carried over into everything I touched today. I started with my floor exercises and non-weighted squats. It’s a wonderful way to start the morning. I don’t necessarily break a sweat doing these, but I feel it in my muscles---it’s a nice start to any day, and I don’t need equipment or a drive to do them. It’s easy. And you know me, I’m all about making things as simple as can be. At the same time I’m trying to keep things simple, my mind and my eyes are trying to absorb more information about better eating and strength training. I’m trying not to complicate things, that would be totally against my philosophy, but I do long for a better understanding of how our body works and why. This is where I am along this road. I’m very close to goal (whatever that is), and after 236 pounds of success---I’m realizing that the time has come to learn more, to broaden my understanding, and strive for optimal results. I’m not there yet. I’m not. I still have weight to lose and don’t you even suggest I tuck in my shirt. I see people that have lost considerable amounts of weight and they haven’t had skin removal surgery, yet they are flat enough to tuck and look great. I want that too. Maybe my body is just different, I don’t know. I’ll strive toward tuckability while dressing in the most flattering un-tucked way. I’m going to get there, no problem! I watched the Dr. Oz 100 Show today. What a wonderful idea and very well put together! I caught Ann on the intro, caught a glimpse or two of Zeusmeatball, and watched proudly as Diane from Fit To The Finish took the main stage. You can listen to an interview I conducted with Diane a while back, it’s still on my sidebar, just click play. Diane did a wonderful job---and everyone agrees, it’s unanimous---She looked absolutely incredible on TV! Diane, you might want to think about a career in TV! Maybe a weight loss type show? Seriously, great job Diane! It was so cool to watch friends on TV, it was just wonderful! I was so proud of everyone that was a part of that show. It was inspiring to watch and Richard Simmons, what can I say---You know I’m a HUGE fan of Richard, He was just incredible. 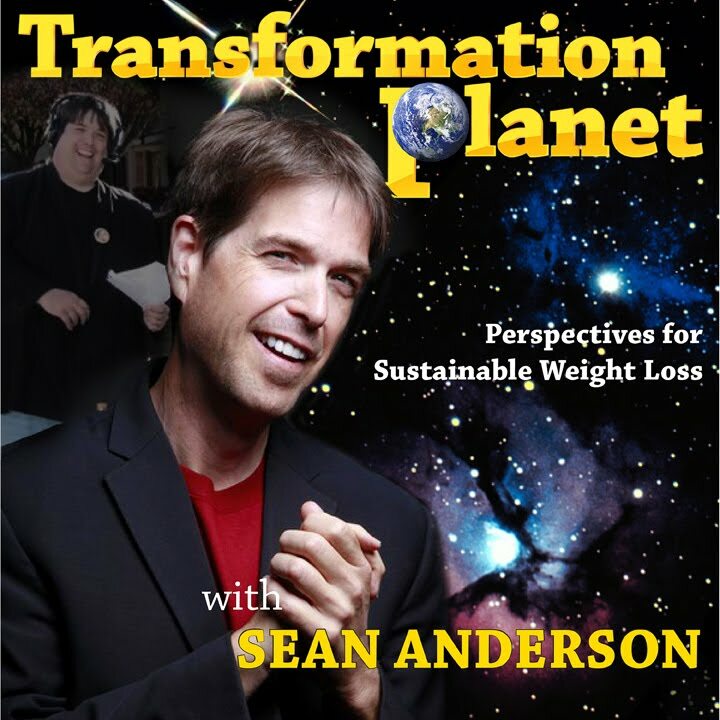 His story about his early eating disorders and how he turned it all around and has kept it off for over 40 years, it’s just amazing. They estimated that Richard has inspired at least three million pounds off of people around the world. That’s a bunch of inspiration. 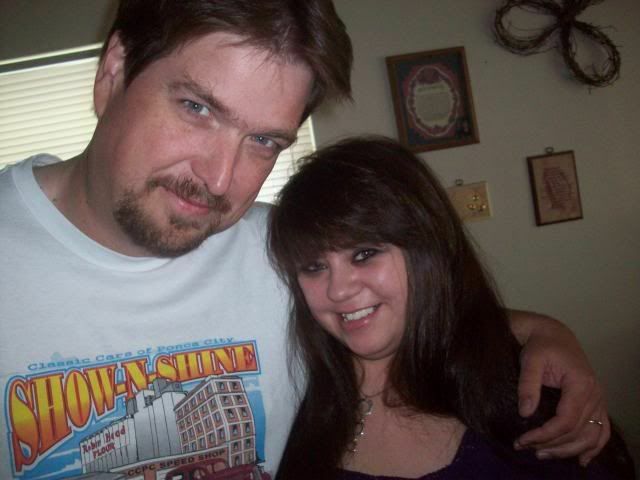 The pictures everyone took with Richard looked so wonderful, what a cherished memory that must be! It was a long day today, but good. I had a creative spark today that resulted in a wonderful commercial that made the client laugh so hard, they had trouble regaining their composure after listening. That success made my day so much better. Big thanks to the voice talent that set that radio spot onto a wonderful level. Stephanie Williams and Anson Williams did an amazing job. It feels good when we do well, you know? Anything that improves our attitude and outlook like this---is a positive thing for our weight loss and fitness goals. And it works both ways. Losing weight and feeling great makes us do a better job, and doing a better job puts us in a positive frame of mind to do well at losing weight and feeling great. Writing yesterday’s post was good for me. I needed to write that one. I’ve felt that way about many post I’ve written. I never think about what I’m going to write. I just sit down with a blank page and start recounting the days happenings. If I get sidetracked or think of something that’s been on my mind, I’ll write about that too. I guess yesterday, being Valentines Day, I was ripe for one of those post that really hit me hard. I have so many emotions tied into that post, some of it was hard to read, it really was. But it was good to write it, and thank you for all of the wonderful support from my friends and family. I remember trying to read that to Irene and Courtney right after I finished writing---and I just couldn’t read the words out loud. My emotions wouldn't let me; it was so deeply true. It hurt so good to read. I think that was the night I truly started loving myself more. I carried so much regret for my morbidly obese life---to finally let go of that self-hatred and embrace myself and my path completely---it was simply emotional cleansing. That’s why I’m at peace with 505 pound Sean. I’ll never go back and I’ll never forget that where I am today is all because of where I’ve been. And I love where I am today. I really do. After a long day I took a long nap. I didn’t plan on taking such a long nap, I just did. I jumped up at what could be considered a good bedtime for someone with my schedule, and immediately hit the fitness center. I wasn’t weight training tonight except for my non-weighted strength training movements. I was after a good cardio workout. I climbed on that treadmill and started jogging slowly. It was only 5.3mph, and I know that’s not fast, but I was able to do it for over a mile without stopping. That’s huge stuff for me! And it made me sweat really good. I knew I had a workout tonight, and that’s all that mattered to me….getting it done, and making it good. I fixed a late dinner that was just incredible. Pita pizza is just amazing! The only problem? I’m eating them way too fast. I’ll be out by tomorrow at this rate and I have yet to find them in a grocery store around here. I talked to a Wal-Mart manager and they said they would see what they could do. I am such a creature of habit, I swear! But I guess it’s ok as long as they’re good habits! I’m taking some needed time off later this week. I’ll be doing some “light” traveling, meeting friends, working out, and resting up. I also plan on learning a few things about exercise, weight training, and good foods from a fellow blogging friend that’s coming into town Wednesday evening!